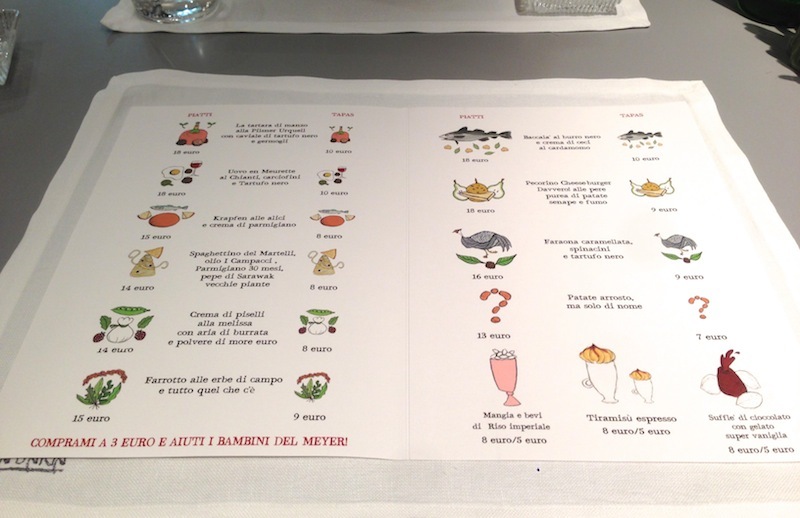 Readers visiting Florence looking for something different will want to check out Ora d’Aria. Chef Marco Stabile’s food is whimsical, creative and full of surprises. Located on a small side street just steps from Piazza Signoria in the center of Florence, Ora d’Aria is an oasis in town that is often teeming with tourists, scooters and that sense of energy bordering on chaos that is so typical of Italy’s larger cities. Ora d’Aria is named after the hour of outdoor activity that was granted to inmates housed in the prison that was next to the restaurant’s first location. The interior design is clean and minimalist, just like the food that emerges from the small kitchen visible through sliding glass doors. Chefs serve the food, adding an element of showmanship that adds to the experience, while never coming across as overdone. Our recent lunch was fabulous. Chef Marco Stabile’s food adds creative twists to the classics, which is frankly a refreshing breath of fresh air after a weak of eating the staples of the Tuscan kitchen. All of the menu items are offered in smaller ‘tapas’ style portions or full portions, which makes it possible to sample many different dishes. The farrotto, a sort of risotto made with farro, is full of the bright, refreshing flavors of spring. I adore Ora d’Aria’s Pecorino Cheeseburger. A thin slice of pear sits atop the burger, which is made with hand chopped beef and Pecorino. 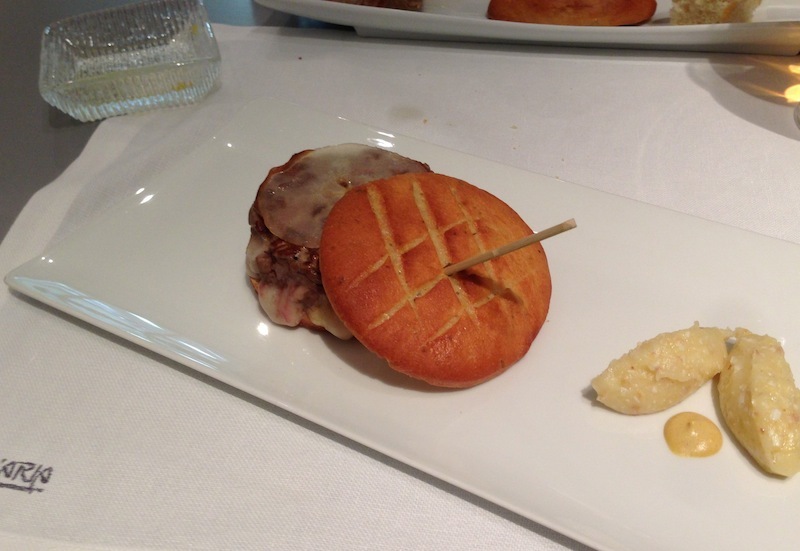 Quintessentially Italian, the cheeseburger disappears pretty quickly. Ora d’Aria has a terrific wine and beer program. Negotiating the list takes a bit of work, though. The first pages of the wine list appear to be sponsored pages, some of which are full of wines that don’t share any of the values of the food here. I am sure running a high quality restaurant in the center of Florence is economically challenging, but there really is no place for such blatant commercialism in gastronomy of this level. All of the more handcrafted, artisan wines are found towards the back of the list, where there is plenty to choose from. Handcrafted beers and ales are also featured. After a day of tastings, the last thing I want to see is wine. Baladin’s Super, a Belgian Strong Ale-inspired beer made in Piedmont, of all places, is delicious and also pairs with the food surprisingly well. 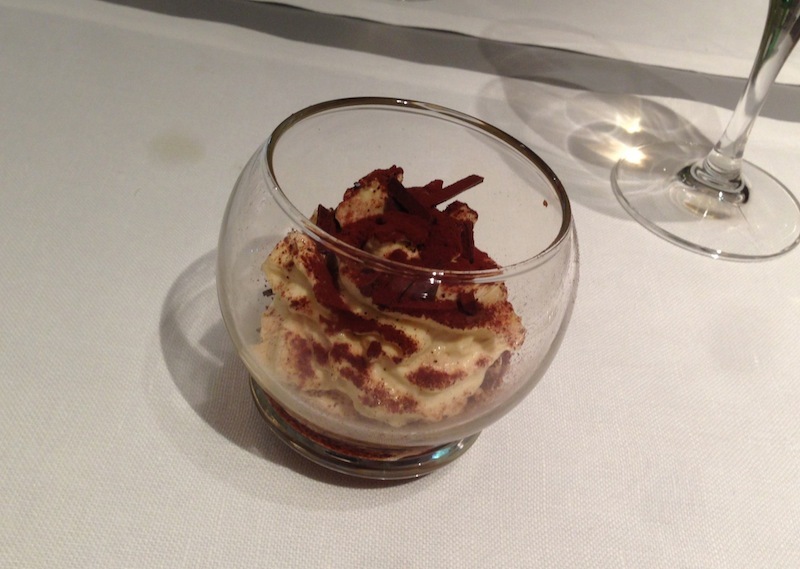 A small portion of tiramisù and an espresso are the perfect conclusion to this light lunch on the run. Readers visiting Florence won’t want to miss Ora d’Aria, where the food, service and ambience offer a modern interpretation on the warmth that is the essence of Italian hospitality.